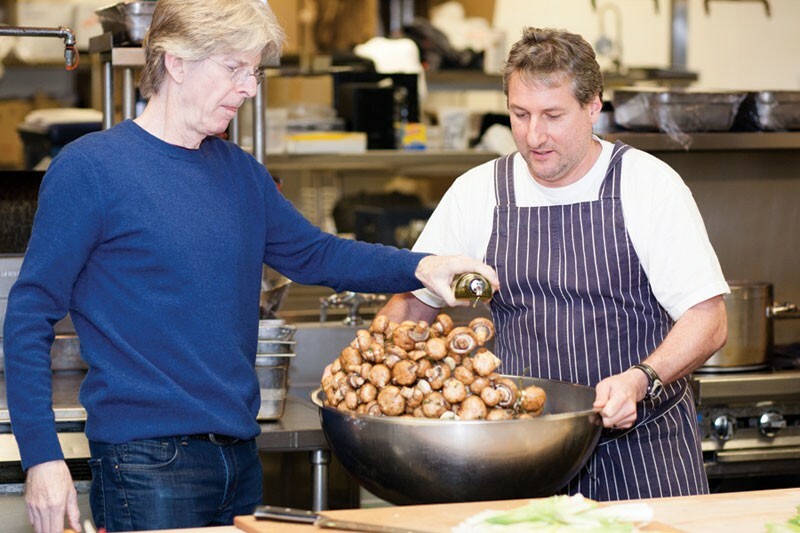 ’SHROOM UNION Phil Lesh helps chef Chris Fernandez with musroom prep in Terrapin's kitchen. The Grateful Dead were always more than just a band. Together with their fans, they created a lifestyle, a philosophy and, mostly, a community. So it only makes sense that Terrapin Crossroads, the new restaurant owned by bassist Phil Lesh and his wife, Jill, is much more than a place to assuage your hunger. On a sizable chunk of land jutting placidly onto the San Rafael Canal, Terrapin Crossroads encompasses a music venue, bar/taproom, outdoor patio, dining room, huge kitchen, upstairs living room, family room and even a private marina for those customers who prefer to sail in. No wonder the folks who work there refer to it as "the campus." It happens to be Day of the Dead when I visit the campus, which is not far from the Grateful Dead's longtime recording studio where albums like Shakedown Street and Built to Last were produced. Though the building (formerly the Seafood Peddler) echoes with the memory of a much earlier time, the mood is celebratory, both an homage to and promise of life lived large. The Grate Room, which is being acoustically remastered and upgraded into what director of operations Brian Reccow calls "a world-class music venue," will reopen on Nov. 29 with a show featuring (who else?) Phil Lesh, Bob Weir and Jackie Greene. "It was good before," Reccow tells me, eyes shining, "but now it'll be phenomenal." Like the Dead, Terrapin Crossroads appeals to a multi-generational crowd. A carpeted dining nook aptly called "the family room" has leather couches and a shelf of toys and games to keep the kiddies entertained. After all, this is the kind of place where you linger, whether on a tall black barstool listening to the free Sunday brunch band in the shade of the soon-to-be-tented patio, or tucked into a cozy booth in the dining room with its well-worn baby grand, fireplace and porthole-style windows. Covering the reclaimed-wood walls are framed photos of Phil and his friends—Jerry before the beard, Dylan before he found Jesus. Truly upscale is the second floor living room, whose color palette is all muted blues, grays and creams with bright splashes of pink and orange. Diners can enjoy live-streamed shows on a flat-screen TV from the often sold-out Grate Room or peruse the bookshelf's eclectic collection of hardcovers on everything from the Sistine Chapel to Chez Panisse. At the culinary helm is chef Chris Fernandez, formerly the executive chef at Sausalito's Poggio, recognized in 2004 by Esquire magazine as one of the best new restaurants in the country. Fernandez takes pride in what he describes as "hyper-seasonal and local gastro-pub food that is accessible to lots of different people." In the drying rack of his kitchen, slices of bright orange persimmons await their fate on the cheese plate. The cuisine is as vast and varied as the Grateful Dead's discography. A charcuterie platter ($14) and rib-eye steak ($28) share the menu with a grilled cheese sandwich ($12) and mushroom risotto ($17). There are also wood-fired pizzas ($11–$14), a fun-to-read cocktail menu (Satan's Whiskers, anyone? ), and plenty of local beer and wine. This is a place designed to make people happy. As Reccow says, "Terrapin Crossroads is Phil's opportunity to give back to a community that has embraced him for so many years." Terrapin Crossroads, 100 Yacht Club Drive, San Rafael. 415.524.2773.